A good number of people are happy with the way they look. They do not want to take any measures to change their appearances or the way their bodies have been naturally created. However, just as many people decide to have their teeth fixed to enhance their smiles, chewing and speech patterns. If they decide to seek the help of an orthodontist, patients might choose the services at Corbett Smiles. In the past, many patients had to wear their orthodontic appliances for longer periods of time. Straightening teeth tended to be a drawn out process that was slow and tedious. Patients today, however due to the many advances in orthodontic treatment, materials and design of their appliances, often enjoy services that are quicker and less involved. Their orthodontist will determine the extent of care they need. Before they are fitted with their braces, people might need initial treatments that include removing plaque, cleaning their tooth surfaces, removal of decay and treating any infections. These initial treatments may take several weeks to complete. These procedures can add time to the length of treatment but will be well worth it to achieve the best result for the patient. Even so, most individuals agree to this care because they want their mouths to look and function better. People with overbites under bites or other severe malocclusions can be difficult to understand. These individuals might not be able to say certain sounds or letters correctly because their tongues do not come into contact with their teeth or other oral structures properly while speaking. Thus, these patients are encouraged to go through the entire orthodontic process to remedy these issues. Maintaining Dr. Corbett's work after the braces are removed may be accomplished by wearing a retainer. These can be fixed or removable. If removable, the retainers are worn in the evening, and when they sleep or whenever they or Dr. Corbett feel it necessary. These appliances prevent teeth from moving out of alignment or becoming crooked again. As they consider braces patients will want a specialist such as Dr. Keith Corbett, who can ensure that their smiles, function and other concerns will be addressed and improved after the treatments are completed. When individuals need solutions for crooked teeth, orthodontists can help. Recent developments in dental technology make it possible for patients to achieve a beautiful smile with modern orthodontic care that produces the desired results. A qualified orthodontist, such as Dr. Keith Corbett will create a custom treatment plan based on the individual patient's specific needs. Orthodontists can help patients of all ages with many different problems that affect the teeth, mouth, and gums. They can choose from a variety of dental appliances to eliminate gaps and correct all the alignment problems that can affect appearance as well as function. Braces, retainers, and aligners are examples of the orthodontic appliances available to restore anyone's smile. Proper alignment is crucial for good oral health. When each tooth is in the proper position, individuals find it easier to brush and floss. This prevents the risk of gum disease, tooth loss, and decay. Correcting any alignment problems reduces abnormal wear on the surface and eliminates digestive problems caused when patients are unable to chew food completely. Regardless of reason for correction, Corbett Smiles can provide effective solutions for patients of all ages. Every patient will participate in a private consultation to discuss the various options available. Dr. Corbett will create a custom treatment plan to meet the individual needs of the patient. Treatment options to produce a perfect smile are available to fit any size of budget. If you recognize any of these signs in your child or yourself, it might be time to schedule a consultation with an orthodontist. A variety of orthodontic "appliances" are available today, thanks to on-going research in orthodontics. Options include traditional metal braces, tooth-colored braces, braces that go behind the teeth, clear aligners and other devices, as appropriate. Check with your orthodontist about the best way to achieve your treatment goals. 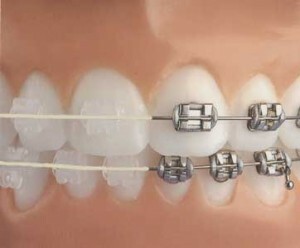 Comfortable and efficient, today's orthodontic appliances also contribute to a stable, long-lasting result. While the appliances used in orthodontic treatment have come a long way since orthodontics became dentistry's first specialty in 1900, what endures is orthodontists' desire to help you achieve your healthiest bite possible.